Doozydog! Club - Dog Daycare - Los Angeles, Seattle, San Diego, Silicon Valley, Dallas & Washington, D.C.
Give dogs what they need and love – socialization, play, naps and exercise, along with a lot of love in our irresistible open play environment. Doozydog! 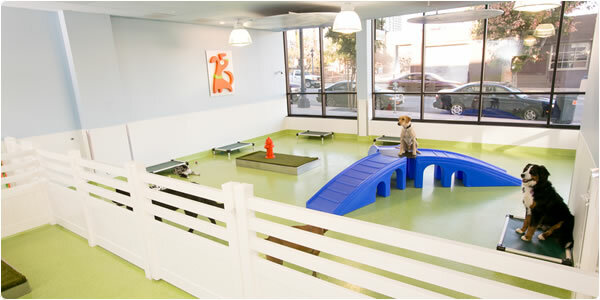 Club dog daycare includes complimentary basic training provided for intellectual stimulation. Dogs will fall in love with our alpha dog handlers who are lovable, compassionate and assertive. Treat and Repeat. And some like to take it easy and lounge! – don’t forget the Style Bar on the way out! Reservations are encouraged for dog daycare at the Play Park, but not required. Conveniently check-in/out anytime 7a – 9p daily. We require quick release collars and I.D. tags on all dogs participating in the Play Park. The quick release collar is the safest option for an open play environment. Dogs must be flea free. Dogs found with fleas or ticks will love a bath at owner’s expense and be much happier. Spay/Neuter Certificate for all dogs six months and older. Dogs must be in good health and not have had or been exposed to any contagious illnesses within 30-days prior to check-in. Doozydog! Club is open for tours during all operating hours. Feel free to bring a friend. We take pride in presenting a safe, friendly and sparkling clean environment at all times. Please refrain from bringing your dog to tour until the Meet & Greet.